Hello friends,while suffering on internet i came up with the Empire Avenue and going to talk about it.Social Media that includes Facebook,Twitter,Orkut,MSN and other social networking sites,is growing day by day and people are getting addicted to Social Media.If you are also one of them then why not show your Social Media power to other users?? If you want to do such,then Empire Avenue is for you.The site is based on the unique concept and is attracting the users over the globe.Empire Avenue is nothing but a social game which allows to enjoy the stock market dealings and daily Ups and Downs harmlessly.To get started you need to signup at Empire Avenue and then to integrate your social media accounts their. Setting profile is as simple as setting up Facebook profile.Once you finish it you are forwarded to your dashboard and there you can see your share price,Net worth and Portfolio etc.Here how dashboard looks like.. So you have setup your Empire Avenue account then now its time to play the Social Stock game and start investing.Along with sign up you are given some Eaves, the virtual currency used there.You can invest in more active users of your category by going to Leaders tab. To keep you investing there are some rewards as well which are unlocked with some set parameters and conditions.You need to unlock then.Further you can add badge to your website as well which will tell your visitors your social media activity and will encourage them to use it as well. Well,This is the most often and tough question to answer.If you are thinking of any kind of real money over there,then sorry it is not for you.Its only about Social Media and show your social power. The best feature is that you can connect your blog RSS Feed as well as an Social account.So your blog posts will be updated on your profile automatically and may be it increase your visitors as well. It has its educational benefit as well because by playing stock market game with your Social accounts you can easily learn the tricks of Real Stock Market and it may lead you as a great investor in Future without any harm. So What are you waiting for?Show your friends,visitors that you keep updated with growing Social Media and come up like a Social Brand. 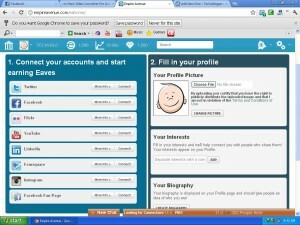 I have also joined the service and now can easily imagine how much deeper the social media is.By the way it has helped to learn the basics of Social Media from scratch and also helped me in gaining some Twitter Followers and Facebook likes as well.So i have gained a mile by investing nothing in real,But yes by investing Eaves(Virtual Currency) on Eaves Avenue.